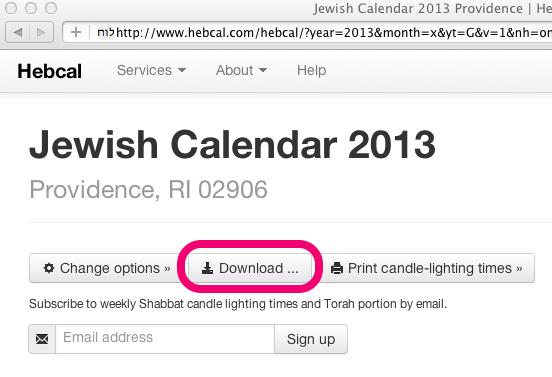 Follow these instructions to add a Hebcal Jewish holiday calendar 5-year feed to Palm Desktop 6.2. Note that these instructions do not work for the older Palm Desktop 4.1.4. If you are using the older version, please instead use our Palm Desktop 4.1.4 for Windows instructions. 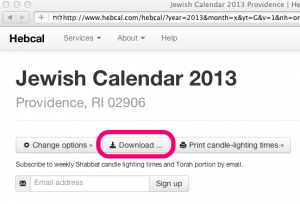 Follow these instructions to add a Hebcal Jewish holiday calendar 5-year feed to the old version of Palm Desktop 4.1.4. Note that these instructions do not work for the newer Palm Desktop 6.2. If you are using the newer version, please instead use our Palm Desktop 6.2 for Windows instructions. Some folks have asked about USA holidays such as Thanksgiving, Labor Day, Memorial Day, etc. Download DateBook+ Holiday updater from PdaWax.com and follow the instructions enclosed in the zip file.